Take part in Socks and Sandals Week! Make a statement with your footwear - wear eye-catching socks and sandals between 13th-19th May 2019 and donate! This is a great activity for workplaces, societies and schools - creating a fun and colourful atmosphere, and the money you raise can help more people receive life-changing footwear! Once you are in your socks and sandals, be sure to take a photo or video of you out in public, perhaps walking the dogs, or going shopping - post it on your social media with #LepraSocksandSandals. Don't forget to tag us (@LepraUK) and nominate your friends to take part and donate too! A donation of just £3 can make a pair of customised sandals for a person affected by leprosy so they can walk without worry or injury. Your posts can help raise awareness of leprosy and help to raise even more funds for the millions of people affected by this disease. Leprosy often damages the nerves in the feet, leaving people susceptible to injuries and ulcers. We provide protective custom-made sandals to help people to walk comfortably and without fear of injury. These simple sandals cost just £3 to make and help children return to school and adults rebuild their livelihoods. Find out more about the connection between our projects and socks and sandals. 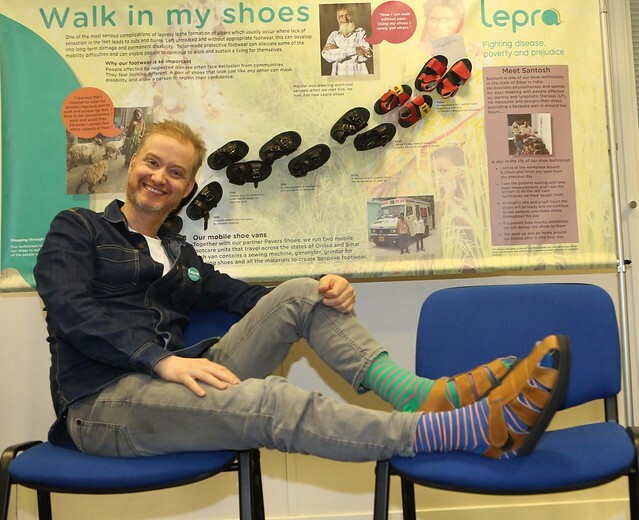 Take a look at the great socks and sandals combinations Lepra supporters have been sporting up and down the country!